Children's House is full for 2019-20. Please call or email Heartland for information about admission and getting on our waitlist. Children from birth through age six have the ability to absorb a vast amount of information and experience with ease. Dr. Montessori called this first plane of development the “absorbent mind.” Young children explode into learning, gain independence, and want to master new skills by themselves. In the Heartland Children’s House they are surrounded by a stunning array of hands-on materials that give them the opportunity to explore on their own, learning in a way that is natural and successful for them. Learning is a joyful experience for children. Children learn to work intently on their own tasks, building concentration and self-discipline. They are given uninterrupted work time and the freedom to move around and interact in any way and with any children, so long as it is not disruptive or disrespectful to others. Academic readiness or the mastery of discrete skills is not the focus. The goal is the development of the whole child—socially, emotionally, physically, and intellectually. The Sensorial Materials provide the children hands-on exploration of materials designed to enhance their discrimination and understanding of size, texture, color, sound, forms, relationships, and more. The Children's House curriculum contains four main areas of focus. Practical Life offers children the opportunity to do what they see adults doing every day. Children relish taking responsibility for watering the plants, preparing and serving food, sweeping the floor—all with real, child-sized tools they can use with ease. The Mathematics Materials are designed to present concepts from the concrete to the abstract, allowing children to see and experience mathematical concepts so that they can truly understand them. The children begin with very simple materials to help them comprehend numbers and quantity, then progress to more complex materials that help the children learn and apply the concepts that underlie addition, subtraction, multiplication, division, and geometry. The Language Materials engage the children, who are already eager to develop vocabulary, explore the alphabet and learn sounds. Through the sandpaper letters, children learn about the individual sounds within words and how these sounds can be represented by symbols. In this way, the children come—at their own pace—to writing and reading as a timely progression of their natural language acquisition. Children may be enrolled for Half Day or Full Day. Somewhere around the sixth year of life, the child begins to make the transition to a new plane of development. This is seen in a dramatic shift from wanting to do everything “by myself” to needing and wanting to do everything in a group of friends. The Leadership Year —Heartland's Kindergarten equivalent—is a place where the needs of this transition can be met. 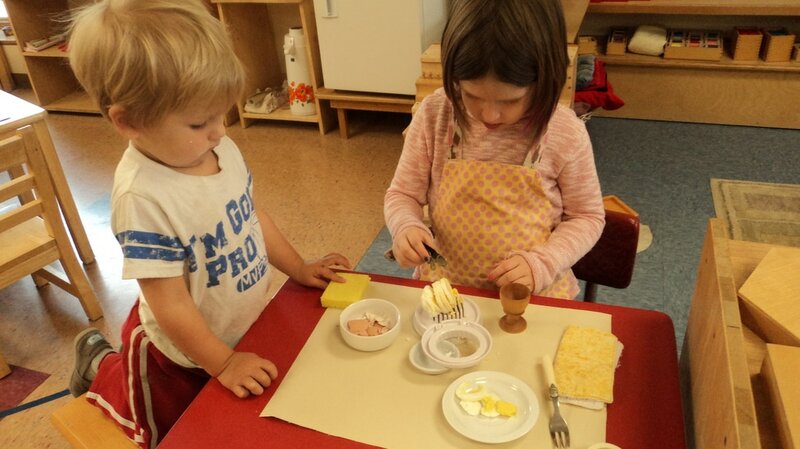 It is a time for group activities such as cooking, building, creating a play, taking nature walks, or undertaking more involved projects of the children’s design. "My Montessori experience made me very independent and has set me up to take charge of my own learning."